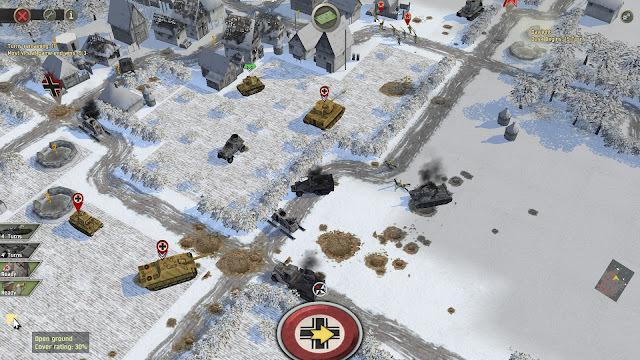 Battle Academy 2: Eastern Front from Slitherine is a perfect example of how to take a winning formula and crank it up a few notches. The game, released in 2014, is the follow on to the original Battle Academy, a title which set the bar for this type of accessible, yet surprisingly deep tactical World War 2 gameplay style. 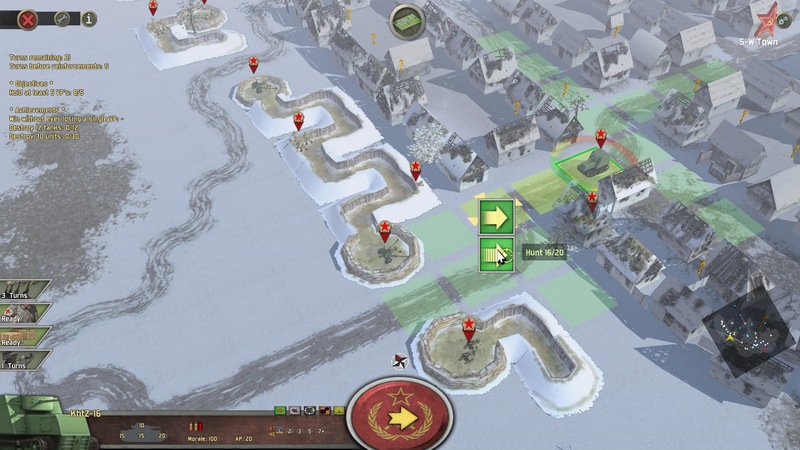 In Battle Academy 2 (BA2) the player takes control of either the Germans or Russians in a series of scenarios fought out using turn-based combat on a map broken into a grid of squares. Locales vary from dense urban centers to wild forests and pastoral villages. Many of the maps are very detailed, with networks of roads and wheat fields, marshes and rivers, and other terrain types generating intriguing choices about how to formulate your strategy. Although at first glance the graphics may appear fairly simple, there is actually a great amount of detail to the unit models, especially the vehicles. All of your favorites are here, from Tigers and T-34's to a smattering of half-tracks and AT guns. In the realm of infantry, there are riflemen, sappers, commandos, militia, mortars, machine guns, snipers, and more. For a title that some might initially deem to be a more casual wargame, there is a actually a lot of content. Campaigns from several phases of the war are available, as well as a tutorial to get you started. In the base game of BA2, there are four campaigns to choose from, two each for the Germans and Russians. These cover several time periods throughout the war, from Barbarossa forward. The Kursk expansion adds another two campaigns covering that massive battle, with the twist that units can be carried forward from one battle to the next. This was big plus for me, as I really like the idea of having a "core" force that I can try to keep alive through a series of battles. On the other hand, the base game campaigns are able to offer a wide variety of interesting scenarios, since they are all independent of one another, other than being set during a certain time period. The scenario design of BA2 is probably some of the best I have seen in any wargame available. Many of them present you with a unique situation to work through. In one mission you have to deal with an immobilized, yet deadly enemy tank in a mostly open field. You only have infantry and a couple of light AT guns to work with. In another you are ambushing an enemy convoy at night with a force made up of partisans. In each scenario, there are primary objectives that you must complete, and secondary objectives that serve as special achievements. This adds a lot of replayability to the scenarios, since getting all of the extra objectives can be a challenge. These objectives are often things like holding particularly difficult victory points, or minimizing losses of certain units. Some are more interesting, like finding and knocking out a hidden enemy outpost, or exiting units off the map mid-battle. German motorized troops, and an awesome little Stug, arrive to press the attack. BA2 controls quite well, using a simple interface to offer a multitude of options. Simply click on a unit and you will see how far it can move via lit up squares. Click on a space, or the unit itself, and a list of symbols will pop up showing you the options relevant to that space. 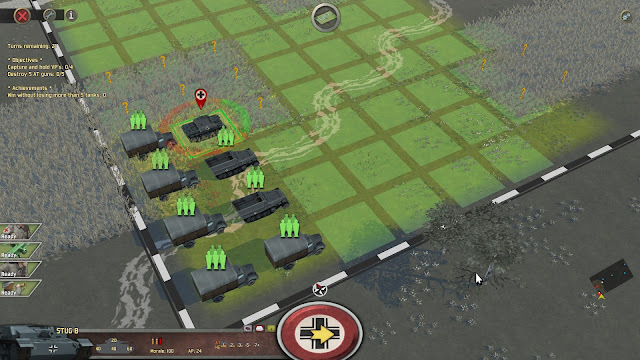 For example, units can move quickly, or move less distance at a more deliberate pace. This is important, since (among other variables) tanks will have lower accuracy after moving fast, while infantry are less likely to be spotted when moving slow. There are many other options as well, including telling a unit to hold fire, having engineers throw smoke grenades, or ordering a unit to observe the area around it, extending its sight range for the round. Clicking an enemy unit will show the odds for whatever type of attack you can make. This is critical to tank duels, since you can see your chances both of scoring a hit, and scoring a kill. The tank combat in BA2 can be quick and deadly, or turn into a drawn out slugfest, depending on the situation and vehicles involved. Maneuvering to get at the flanks or rear of a heavy enemy tank can greatly increase your chances of knocking it out. At the same time, you want to keep your forward armor facing the enemy if at all possible. Even the most imposing steel beasts can be taken down by single lucky shot, or they might shrug off a dozen hits and keep rolling. Maximizing your odds is the key to winning tank battles. Usually you have enough forces that losing any one unit won't cost you the battle. A potent force prepares to face the Ruskies. Infantry units require tactical finesse to use effectively. Rush them forward mindlessly and they will get slaughtered. Use covering fire to suppress an enemy, then send in assault troops to overrun the enemy position and you can win with few casualties. Infantry are also highly effective against tanks and other vehicles in close terrain. They can disappear into almost any terrain feature on the map. Sending a half-track or tank on a long move through a village you have not cleared will lead to certain destruction. You will usually have some special abilities on tap in any given scenario. These use a cooldown timer, so you must be careful about when you use them, but not so cautious that you miss openings while waiting for the perfect moment. These abilities include basic items like healing an infantry squad, promoting a unit, or dropping supplies. Sometimes you also get more explosive options, like calling for artillery and air strikes. Several turns later, my heavy tanks wipe out enemy vehicles while Flammpanzers keep the infantry at bay. While fighting, units can be promoted, gaining better stats and becoming more effective. Units that reach the highest rank can even get an extra attack each turn, which is very useful. Other special abilities can also be unlocked, like AT guns using more effective anti-tank rounds or infantry squads gaining a sniper shot. Right at first, BA2 can be a somewhat frustrating game until you find the rhythm of how to play it. It demands a more deliberate approach to combat than one might presume. Once you figure out the finer points of line of sight, the ranges of different units, and the importance of paying attention to unit morale, the game becomes much more enjoyable. In my first playthrough of some missions I took heavy losses and wondered how in the world I was supposed to win. After playing further into the game, I can go back to those same scenarios and conquer them easily. Did I mention the huge variety of units available? Here we see everything from partisans to Valentines. The game offers a couple more ways to play outside of the campaign scenarios. You can also play semi-random skirmishes where you pick out a force and go against an AI force on one of the many different maps. The AI can almost always put up a decent fight, since it knows how to hide units in cover and will attack aggressively wherever you are weak. However, for a truly clever opponent you must go online. 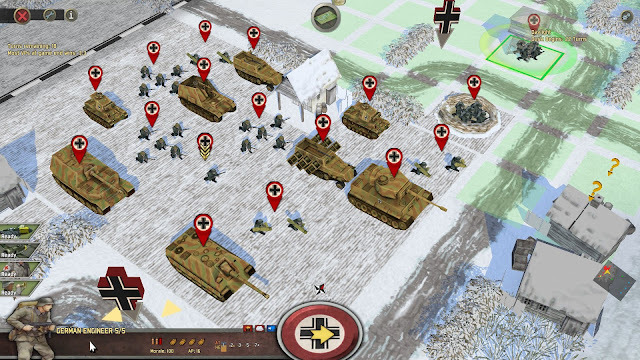 Fortunately, BA2 uses Slitherine's PBEM++ multiplayer model, which sets the standard for this type of turn based wargame with its asynchronous play. Once you join battle with another player, you simply play your turn and then go back to the multiplayer menu. If the other player isn't online, you are free to then join another match and play a turn in it. You can have several matches going in this manner, and you will receive a notification or email when it is your turn to play again. This is great for bigger battles especially, since you can play a little at a time, instead of sitting at the computer for two hours straight. If you don't want to fight another human, you can also team up against the AI in several cooperative scenarios. Even though the game has been out for years, there are still quite a few people playing online, so you shouldn't have trouble finding a match. I found that playing the game online was quite addictive. The co-op scenarios force you to communicate and use teamwork, while the larger PvP skirmishes give you a lot of freedom in terms of force composition and strategy. You never know what kind of units your enemy will be fielding, or how they will use them. Although the single player game is good, the online play is where the game really shines. Especially so because it is so easy to get a match going against any willing opponent. Compare to, say, Combat Mission, where you have to arrange a match outside the game, and need a third party tool to automate sending new turns back and forth. Soviet infantry prepare to hold against the onslaught, while a improvised tank creeps forward to assist. 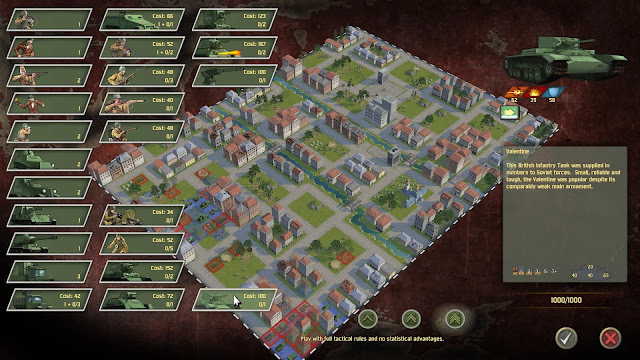 The game also comes with an easy to use editor, which other players have used to create a large number of custom maps and scenarios. This new content can be easily acquired from within BA2 itself. You just click on and download whatever suits your fancy, right there within the game. There are only a few single player scenarios available, but thanks to the efforts of a few community members, there are a couple dozen additional multiplayer maps to try out. Something should also be said about the sound in the game. There are very good sound effects for every different type of weapon in the game, including big crunchy artillery shells and roaring flamethrower blasts. Tank engines rev up and infantry shout in German or Russian as they are victorious in a fight, or find themselves running for their lives. All in all, BA2 is a polished experience with no major flaws that I could uncover. I tried to think of something to criticize about the game, but really there is nothing bad to say about it, unless you are looking for a more realistic experience. This is not Combat Mission or a Graviteam Tactics type of game. Units tend to have arbitrary ranges that they can engage at, and even shorter ranges at which they are actually effective, which takes some time to adjust to. You'll also note the relative lack of artillery, in a warzone that was well known for massive amounts of it. It is treated more like a special ability than a regular part of your force. Along those lines, there's nothing realistic about being able to call in pin-point airstrikes anywhere you want to make an enemy go boom. However, realistic is not what this game sets out to do. It gives you all the different units you could want, and sets them loose in tactical combat that is just deep enough to make things very interesting, without bogging you down in unnecessary detail. 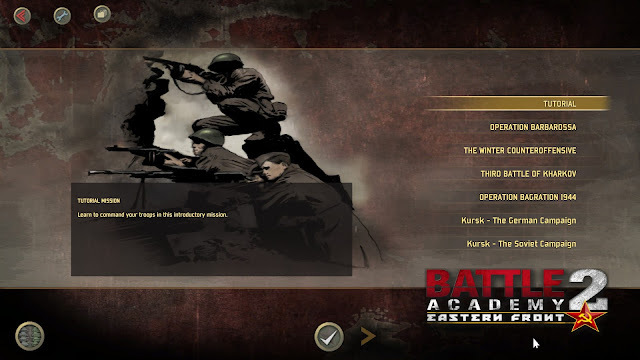 If you are looking for a fun tactical combat game set on the Eastern Front, that is accessible and comes with a ton of content, look no further than Battle Academy 2. If you want even more toys, and especially the linked campaigns, pick up the Kursk expansion. Nice review. I waited a long time to play BA2 since BA had had looked to cartoon-like. But as you mentioned, there's a fair amount of depth - mixed with a strong fun factor. I play it on the iPAD quite often and will be a long term keeper for me.